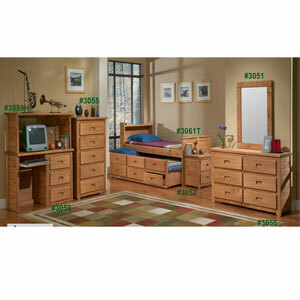 Twin or Full Bookcase Captain Bed with Drawer Unit or Trundle Unit. 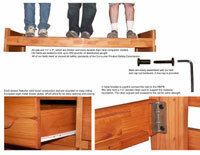 Built of Solid Pine And Features A Six-Drawer Under Bed Storage Unit. Drawer Unit Is 18 In. Deep Allowing Another 3991D Six-Drawer Unit To Be Installed On The Opposite Side Giving A Total Of Twelve Drawers (Optional). Bed Also Available With Rollout Trundle That Slides Under The Bed Out Of Sight When Not In Use. The Trundle Features Three Bottom Storage Drawers Below Three Nonworking Drawers. 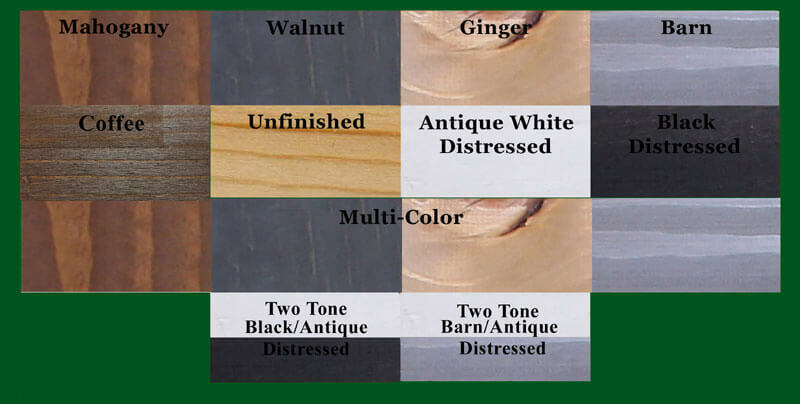 Click Here For Color Chart Mahogany Finish is a Water Based, Low VOC, Non-Flammable, Low Odor Stain. No varnish is applied. This makes it very easy to touch up. Unfinished products have no stain or varnish applied. Unfinished products are sanded and ready for you to apply your own finish.